Background: Co-morbid major depressive disorder (MDD) and cardiovascular disease (CVD) is associated with poor clinical and psychological outcomes. However, the full extent of the burden of, and interaction between, this co-morbidity on important vocational outcomes remains less clear, particularly at the population level. We examine the association of co-morbid MDD with work outcomes in persons with and without CVD. 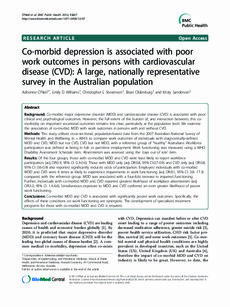 Methods: This study utilised cross-sectional, population-based data from the 2007 Australian National Survey of Mental Health and Wellbeing (n = 8841) to compare work outcomes of individuals with diagnostically-defined MDD and CVD, MDD but not CVD, CVD but not MDD, with a reference group of "healthy" Australians. Workforce participation was defined as being in full- or part-time employment. Work functioning was measured using a WHO Disability Assessment Schedule item. Absenteeism was assessed using the 'days out of role' item. Results: Of the four groups, those with co-morbid MDD and CVD were least likely to report workforce participation (adj OR:0.4, 95% CI: 0.3-0.6). Those with MDD only (adj OR:0.8, 95% CI:0.7-0.9) and CVD only (adj OR:0.8, 95% CI: 0.6-0.9) also reported significantly reduced odds of participation. Employed individuals with co-morbid MDD and CVD were 8 times as likely to experience impairments in work functioning (adj OR:8.1, 95% CI: 3.8- 17.3) compared with the reference group. MDD was associated with a four-fold increase in impaired functioning. Further, individuals with co-morbid MDD and CVD reported greatest likelihood of workplace absenteeism (adj. OR:3.0, 95% CI: 1.4-6.6). Simultaneous exposure to MDD and CVD conferred an even greater likelihood of poorer work functioning. Conclusions: Co-morbid MDD and CVD is associated with significantly poorer work outcomes. Specifically, the effects of these conditions on work functioning are synergistic. The development of specialised treatment programs for those with co-morbid MDD and CVD is required.